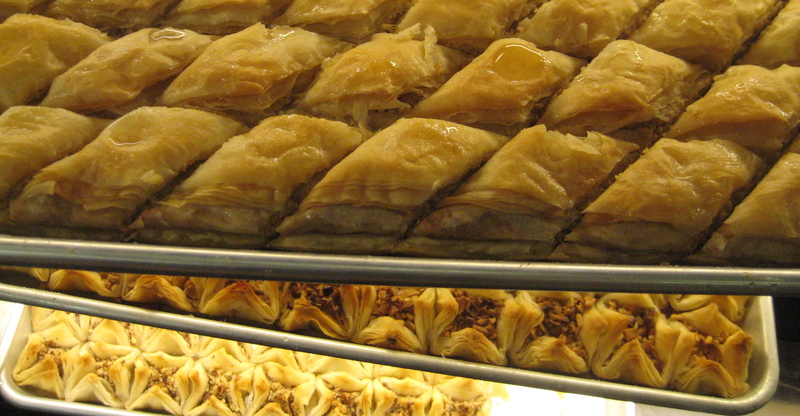 If you think baklava is simply a soggy square of solid sweetness, guess again. Tasting baklava made from fresh filo dough – instead of the frozen stuff that comes in a box – is an epiphany. Standing in front of the impressive dessert case at Oakland’s Oasis Market, I gently bite down on a glowing, golden cube and feel my teeth delicately shattering paper-thin layers one by one as a delectable shower of honeyed confetti rains down on my tongue. Now, like a phoenix rising from the ashes, Oasis Market on Oakland’s Telegraph Avenue– home to an amazing array of Middle Eastern specialties — has taken over as the only Bay Area source of handmade filo dough. I recently was invited into the kitchen to watch pastry chef Mohamed Khaleed Mahrousa in action. The thirty year old Mahrousa, a native of Aleppo, Syria, belongs to a family that is famous for sweets. He started on the path to producing perfect handmade filo at a cousin’s bakery when he was 13. “It was hard work and took me 2 years to learn,” he says smiling. Oasis Food Market, 3045 Telegraph Ave. Oakland, 510-655-5111, promises to have its website up and running and able to take online orders soon. Meanwhile, call to place an order for their fresh filo which is only made 2 days a week and sells for $3.99/lb. I’ve always wanted to make baklava and so when I had to test a recipe from “The Kosher Baker: Over 160 Dairy-free Recipes from Traditional to Trendy” (Brandeis University Press) by Paula Shoyer, I chose her version of the Middle Eastern sweet. Hers is vegan, has more filling and is not as sweet as many others I’ve tried. The orange blossom water is traditional and gives the pastry a floral essence. 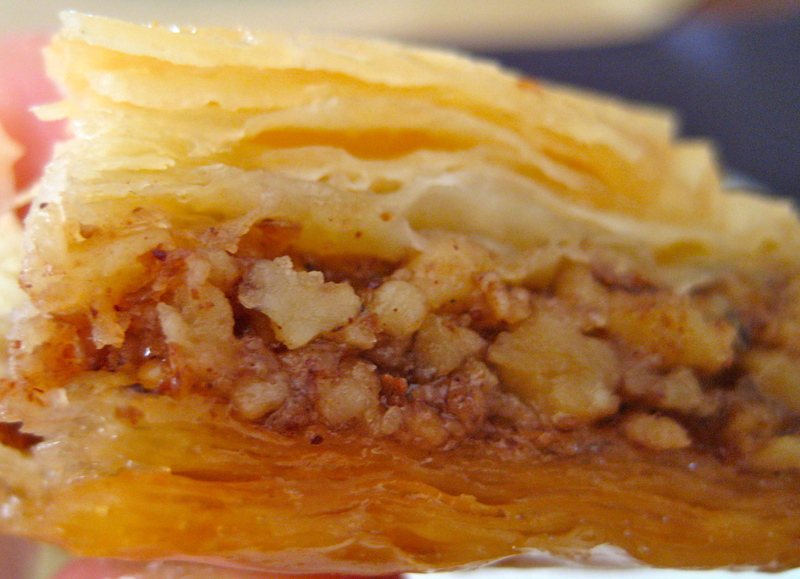 The mix of nuts gives the baklava a very complex taste. This recipe is adapted from Shoyer’s book. This recipe is written for defrosted, commercial filo dough. It is even more spectacular made with fresh. If you’d like, brush canola oil on the filo dough layers rather than spraying them with the spray oil as Shoyer does. Preheat the oven to 350 degrees. Put pistachios, almonds, walnuts and ¼ cup of sugar in food processor with metal blade. Process until ground into tiny pieces but not pulverized. Grease a 9”x13” pan with spray oil. Cut sheets of filo to size if necessary. Lay 1 sheet in pan, spray with oil. Repeat 4 times until you have a stack of 5 sheets. Scatter ¾ cup of the nuts mixture evenly on top. Repeat until you have 5 filo layers of 5 sheets each and 4 nut layers. Finish with the filo on top. Spray the top sheet with oil. With a sharp knife, make diagonal cut through all the layers across the pan, about 1 ½” apart. Then make diagonal cuts in the other direction. Place on middle rack in the oven and bake for 30-40 minutes or until lightly browned. While the baklava is baking, make the syrup. Place remaining sugar, lemon juice and water in a small pan and bring to a boil. Reduce heat to medium and cook uncovered for 5 minutes. Turn heat to low and simmer for 7 minutes. Take pan off heat, add orange blossom water and stir. When the baklava is baked, remove from the oven and immediately pour the syrup over it. Let cool in the pan. This entry was posted in Middle Eastern Food and tagged baklava, fresh filo, fresh phyllo, homemade filo, Oasis Market. Bookmark the permalink. Thanks for letting me share your very excellent post! I am happy to find a place that still makes filo by hand. Next time I am in town, I will be there. There used to be a place in San Fransisco that made handmade filo. I think Julia Child wrote about them, It was sort of near the Castro area I think. A film student made a film of them making filo. I don’t know if any film schools/colleges in San Fransisco may have a copy of the film., Anyhow, I am so glad to know that someone still makes it by hand. tHE FILM WAS MADE IN THE MID 1970S i THINK. I agree: handmade filo dough is so much better than the frozen-in-a-box kind that it kind of spoils you from then on. It’s hard to go back. Hope you have a chance to stop in at Oasis Market. for a nibble.